Get Yourself A New ‘Maleficent’ Fashion — See The Styles! In celebration of Walt Disney’s Maleficent‘s release on Blu-Ray/DVD combo on November 4th, Disney and celebrity stylist Natalie Mark have teamed up with Forever 21 to put together some amazingly creative and stylish outfits inspired by the main characters of the live-action film. Check out a few of these spellbound outfits below to see which one fits your fashion needs! Walt Disney Studios Releases New ‘McFarland, USA’ Trailer — Watch! Walt Disney Studios is proud to present the newest film, “McFarland, USA”. Inspired by the 1987 true story, “McFarland, USA” follows novice runners from McFarland, an economically challenged town in California’s farm-rich Central Valley, as they give their all to build a cross-country team under the direction of Coach Jim White (Kevin Costner), a newcomer to their predominantly Latino high school. Coach White and the McFarland students have a lot to learn about each other but when White starts to realize the boys’ exceptional running ability, things begin to change. Soon something beyond their physical gifts becomes apparent—the power of family relationships, their unwavering commitment to one another and their incredible work ethic. With grit and determination, the unlikely band of runners eventually overcomes the odds to forge not only a championship cross-country team but an enduring legacy as well. Along the way, Coach White realizes that his family finally found a place to call home and both he and his team achieve their own kind of American dream. Disney’s “McFarland, USA” stars Kevin Costner, Maria Bello, Morgan Saylor, Martha Higareda, Michael Aguero, Sergio Avelar, Hector Duran, Rafael Martinez, Johnny Ortiz, Carlos Pratts, Ramiro Rodriguez, Danny Mora, Valente Rodriguez, Vanessa Martinez and Chris Ellis and is directed by Niki Caro with screenplay by Christopher Cleveland & Bettina Gilois and Grant Thompson, and story by Cleveland & Gilois. 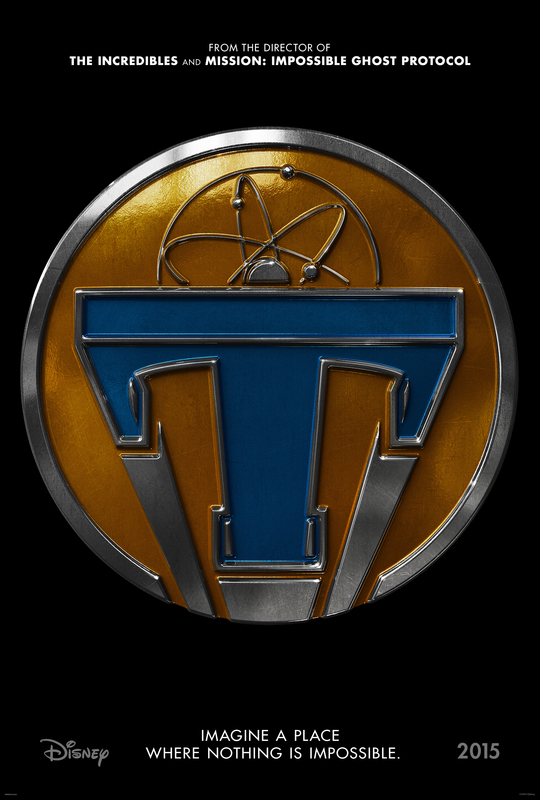 Gordon Gray and Mark Ciardi are producing, with Mario Iscovich and Mary Martin serving as executive producers. 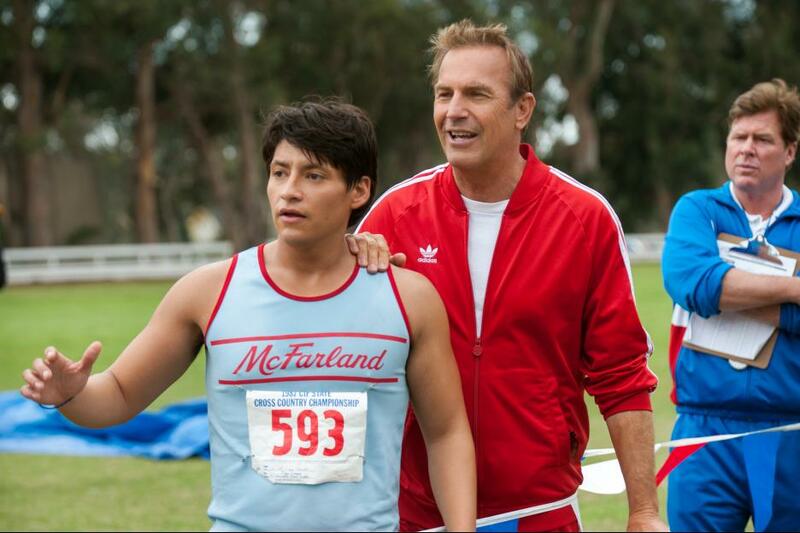 “McFarland, USA” releases February 20, 2015. 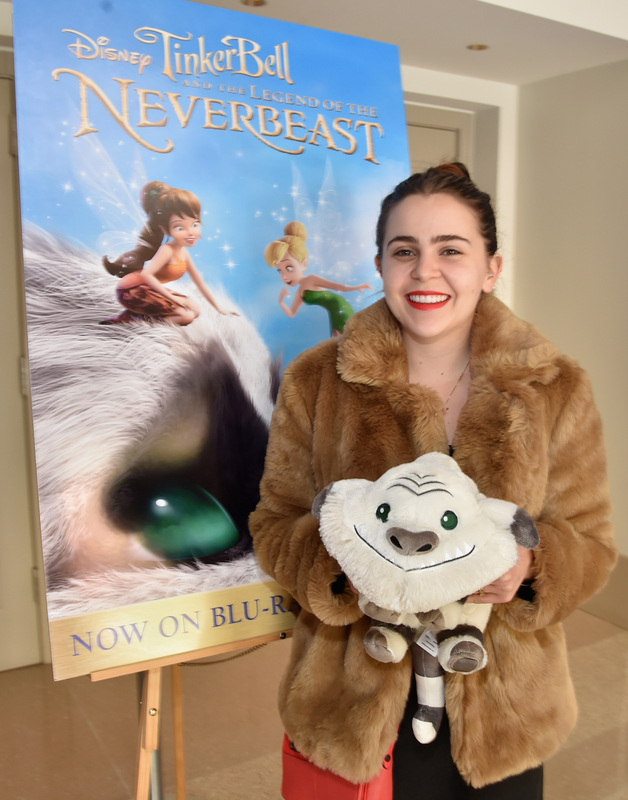 You can check out the trailer for Disney’s film on Yahoo! Movies right HERE or down below! CinemaCon is being held in Las Vegas this year at the Caesar’s Palace — the event was hosted by Alan Horn, Chairman, The Walt Disney Studios, and Dave Hollis, EVP, Theatrical Distribution, The Walt Disney Studios. 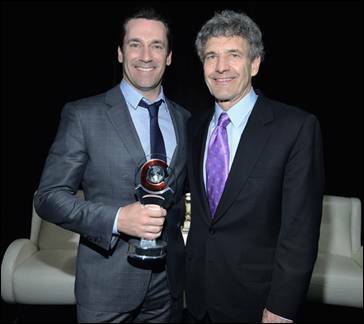 Jon Hamm, star of the upcoming “Million Dollar Arm”, was on hand to receive the CinemaCon Award of Excellence in Acting and afterwards there was a special screening of the film. Million Dollar Arm is based on a true story, “sports agent JB Bernstein (Jon Hamm) finds that business has changed and things aren’t going well for his career. In a last ditch effort to save his livelihood he concocts a scheme to find baseball’s next great pitching ace. Hoping to find a young cricket pitcher he can turn into a major league baseball star, JB travels to India to produce a reality show competition called “The Million Dollar Arm.” With the help of cantankerous but eagle-eyed retired baseball scout Ray Poitevint (Alan Arkin), he discovers Dinesh (played by Madhur Mittal from “Slumdog Millionaire”) and Rinku (played by Suraj Sharma from “Life of Pi”), two 18 year old boys who have no idea about playing baseball, yet have a knack for throwing a fastball. Hoping to sign them to major league contracts and make a quick buck, JB brings the boys home to America to train. While the Americans are definitely out of their element in India — the boys, who have never left their rural villages — are equally challenged when they come to the States. As the boys learn the finer points of baseball — JB, with the help of his charming friend Brenda (Lake Bell) — learns valuable life lessons about teamwork, commitment and what it means to be a family”. For more information about the movie, please check out all of the websites below. Disney’s newest animated movie FROZEN has been a box office juggernaut taking the crown as the highest-grossing original animated movie in history — a title previous held by Finding Nemo. The execs at Disney are taking advantage of the films popularity and are releasing an all-new sing-along version of the Oscar-nominated, Golden Globe-winning big screen adventure in more than 2000 theaters nationwide. 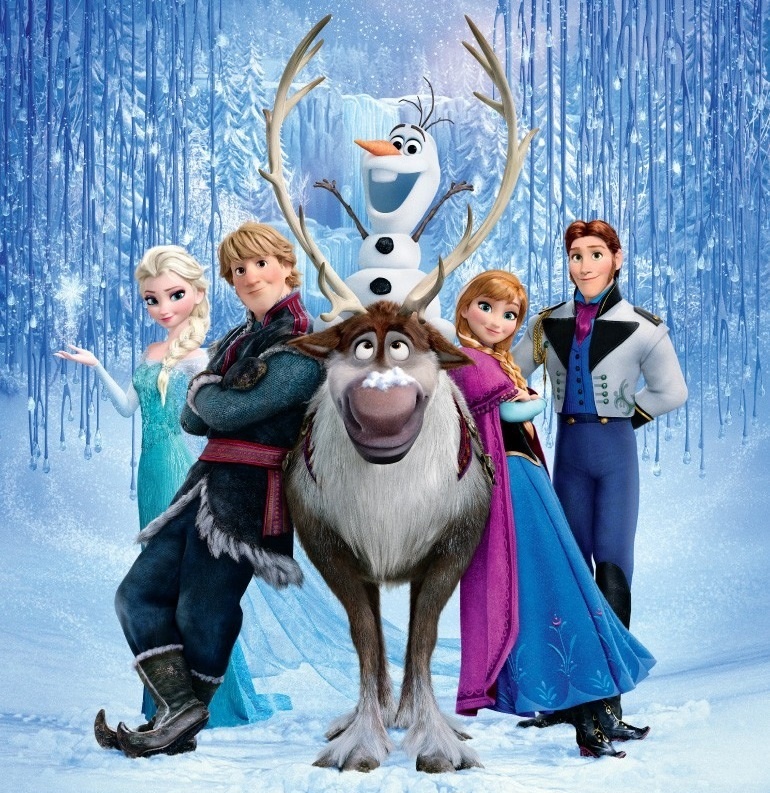 “Frozen” is going to be released in theaters beginning this Friday, January 31st — the film will feature on-screen lyrics and a magical bouncing snowflake will accompany select showings. 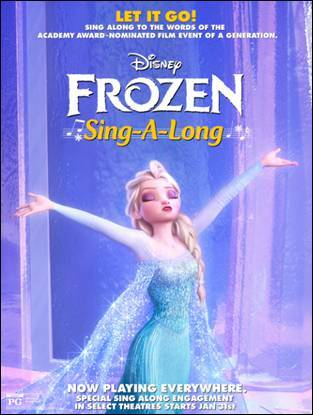 Check out the YouTube video below for a sneak peak of the new sing-along version of FROZEN.